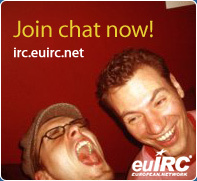 euIRC® - European IRC Network - Welcome to euIRC! Whether you already know euIRC or if you like to get to know it - we hope you can find what you are searching for on our website and would like to wish you a lot of fun with chatting on euIRC! Here you can find some selected channels on euIRC. Funny Channel with people solving your IRC problems. Linux support for all distributions. #XChat is a german support channel for the irc-client XChat. The official euIRC webradio. Chatting, good music and much more!